Description: The driving force behind water movement in plants is evaporation through the leaves, which acts like a magnet pulling water up the plant’s plumbing system. 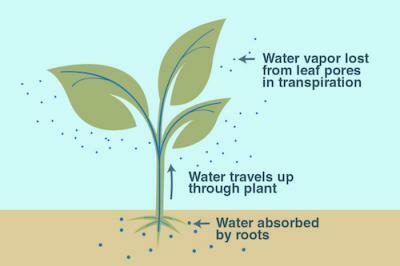 However, because water is evaporating from a living surface, it is called transpiration. The problem is that plants want to hold onto their water and not let it all out through transpiration. Therefore plants are constantly struggling to hang on to their water. Molecules are in constant motion, and through diffusion spread out evenly to take up whatever space is available to them. Of course water molecules diffuse too, but in living things water often diffuses across a membrane. This process is called osmosis. Water moves in and out of cells through osmosis, and always moves from regions of high concentration to regions of low concentration. Here’s the tricky part though: water concentration is different than solute concentration, which refers to the stuff dissolved in the water, and keeping those two concepts straight is necessary to figure out where water will go inside a plant.